The annual Eurasian Adventure! One of our favourite and most popular tours takes you across nuclear wastelands, unrecognized states, Soviet time warps and more. Twenty countries, five weeks – join the whole thing, or pop in and out as you please. The tour starts in Beijing with an overnight stay and optional visit to the Mausoleum of Chairman Mao, before embarking on the epic, six-day trip that is the Trans-Mongolian, or the “party train” as it also known. 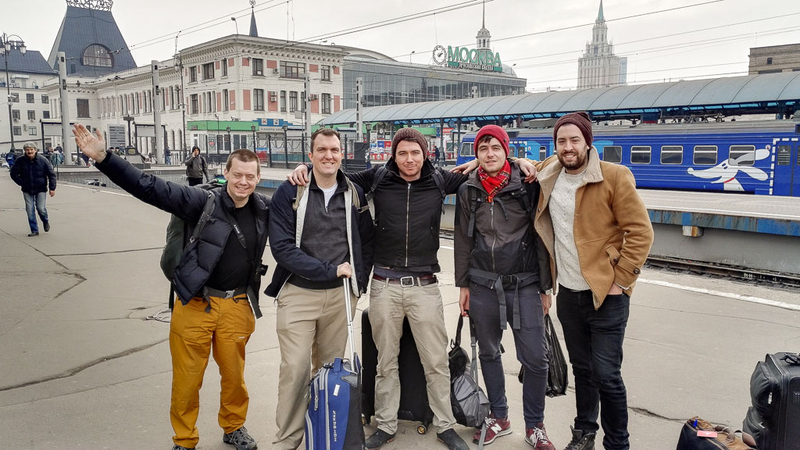 Following our arrival in Moscow, we start to fully embrace Soviet nostalgia by visiting all of Moscow’s top sites, before taking the train to the most Soviet of all republics: Belarus and its capital Minsk. Here we will be seeing such treasures as the former residence of Lee Harvey-Oswald, as well as staying in our own private apartment. This leads us on to group 3, our big group, where we will be visiting not only Pripyat (Chernobyl), but also doing the extreme missile base tour, as well as sampling the night time delights on a bar crawl. Thanks to our contacts in Pripyat, we can usually sneak in some secret sites that we are not even allowed to blog about! 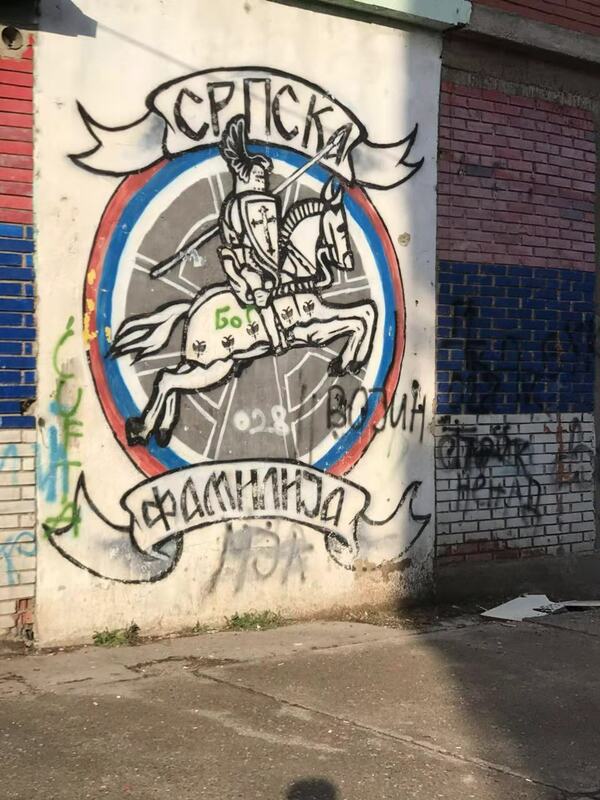 After group 3 leave us in Kiev, group 4 will continue on to Odessa, then onto Tiraspol, capital of the breakaway republic of Transnistria – if you want off the beaten track, this is it. We really mix it up here by having one night in a very Soviet hotel before transferring to a slightly more luxurious offering in the countryside, a true Soviet time warp. Following a few nights here, we visit Moldova, the only ex-Soviet republic to vote the communists back in, before taking the overnight bus to Bucharest, a popular flight hub making arrangements for onward flights easy. Group 5 completes the full communist chic element, visiting the former homes of Ceausescu, Tito and Hoxha, via Romania, Macedonia and Albania. We will additionally visit contemporary hot spots of Mitrovica and Kosovo before finishing in Albania. Group 6 will be moving on to the beautiful capital of Montenegro: Podgorica. After a day’s exploration, it’s across the border to Belgrade to take in the sights of this incredible city, before moving onto Sarajevo, Mount Igman to see the abandoned and crumbling ruins from the 1984 Sarajevo Winter Olympic Games and Zagreb. 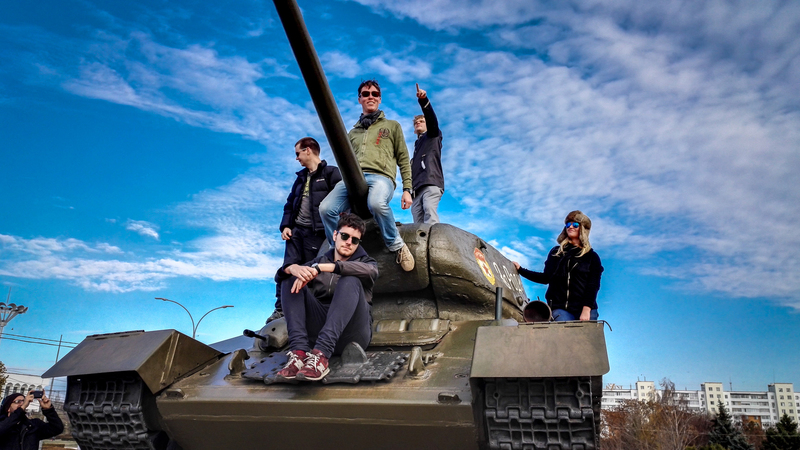 Group 7 Eurasian Tour, we truly complete the adventure before traveling along the rest of the Iron Curtain through Hungary, Slovakia, the Czech Republic and Poland, ticking off visits to all the former Warsaw Pact countries throughout the trip. Our final night before we say goodbye to Group 7 in Warsaw and cheers each other one last time with promises of reunions! A new addition this year, our group 8 will take us to Kaliningrad the westernmost part of Russia! An exclave created by the Soviets after the fall of the Third Reich and the most militarized area in Europe. The tour wraps it up completely with our group 9 which takes us through the three countries of the Baltics, starting in Vilnius for an extreme Soviet roleplaying game and continuing through Riga to go for a tank ride and finishing in Tallin and back to the russian border. Arrive in Beijing. Meet up for dinner with your traveling companions and guides and head out for a few beers. 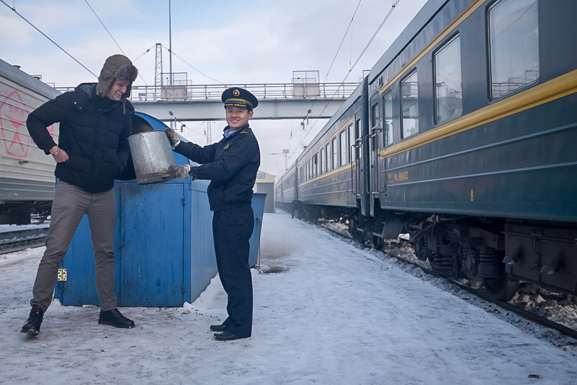 01.25 arrival in Mongolian border town of Dzamyn Ude, for the second set of immigration and customs formalities usually lasting about two hours. Again, we may remain on the train or will possibly be allowed to get off. 14:35 arrival at Ulan Bator, the capital city of Mongolia, for a quick 45 minute stop with breathtaking views all the way there. This stop is a good chance to buy a few bits for the rest of the journey, with money changers and cheap shops aplenty. Enjoy the breathtaking views past the world’s biggest lake: Lake Baikal, on your way to a 9.37 stop in Irkutsk. 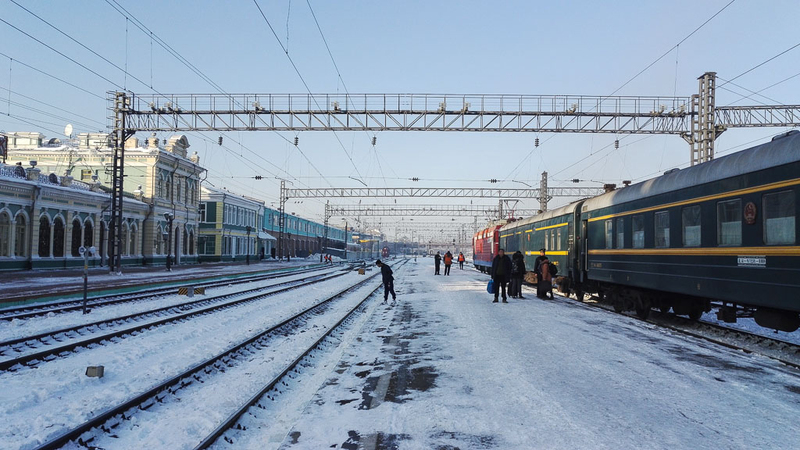 Afternoon stop in Novosibirsk and evening stop in Omsk. Last boozy night on the party train. Dinner and night out in Moscow. Communist times are truly gone. Morning trip to Red Square, Mausoleum of Lenin, and the Kremlin. Lunch with the rest of the group. The early evening is your chance to independently explore Moscow or you can join the group on a walk around Cosmonaut Park and a trip to the Cosmonaut Museum (extra cost). Dinner at local Russian restaurant – Did someone say Borsch?? 11.49 pm departure for Minsk on sleeper train. No border checks, so a pleasant night’s sleep. 08.06 arrival in Minsk and transfer to hostel. Morning and afternoon visits to the Former Residence of Lee Harvey Oswald, Belarus National Museum of History & Culture, and the infamous KGB building! Dinner in the Old Town. Night of debauchery in Minsk of the most delightful and cheap of ex-Soviet cities. Excursion to the Belarusian Museum of Folk Architecture and Rural Lifestyle. Back to Minsk for some dinner and drinks and then stock up for the 10.40 pm train to Kyiv. Morning arrival Kyiv, check into Kiev Central Station Hostel. Group drinks and dinner at the legendary Hospital Bar, a Kyiv favourite, with some medically themed, entertaining shots! 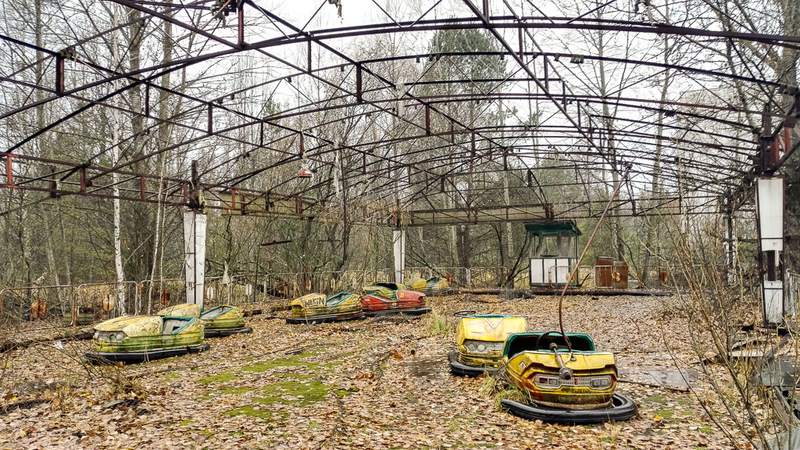 Day in Pripyat, ghost-town of the world’s worst nuclear disaster. Lunch on site. During the trip, we will be visiting some extra secret sites that cannot be mentioned here! Return to Kyiv and head out for some dinner and dancing at a local 24 hour bar. Extreme Missile Base (ICBM Rocket Base) Tour in Ukraine. If the Missiles were launched from this top secret Soviet base, the target cities were New York, Chicago, London and Paris and after about 30 min and one button the world as we know it would have been gone! Group 3 take the bus back to Kiev and end tour. Group 4 continue onto Odessa where we check into our hostel. Breakfast in Odessa, followed by tour of the Catacombs (extra cost). Early evening departure for the 3 hour bus ride to Tiraspol, capital of the breakaway republic of Transnistria. On arrival in Tiraspol, we register with immigration before transferring to the local version of the Soviet Inn tourist hotel. This is the quintessential Soviet experience in the region’s original tourist hotel. We go for dinner locally with drinks afterwards in the country’s only nightclub. We get up early for breakfast near the hotel. Pobedi Park (across the street from the hostel). Chance to ride the 50′s style amusement park. Walk down October 25th Street (the main drag) which has a large billboard of former President Smirnoff (real name) standing with the Presidents of 2 other Soviet breakaway Republics of South Ossetia and Nagorno-Karabakh. October 25th St. to City Hall (government). It has a large bust of Lenin for great photos. Russian Orthodox Church of Tiraspol. Newly renovated with golden domes. Guests can buy inexpensive Russian Icons here. We will go inside. Women must wear a scarf on their head, and men must take their hats off. The Eternal Flame Independence War Memorial. Parliament, housing the biggest statue of Lenin outside Russia. We walk to the river park. There is a walking bridge here for great panoramic photos of the river and downtown Tiraspol. Lunch at Andy’s Pizza, somewhat of a PMR icon of a restaurant. Convenient store in the centre of town with $3 for a bottle of one of the most prized Cognacs in Europe (outside France of course). During Soviet times, this was the brandy. We leave the hotel for Bendery via mini-bus number 20. The journey takes 20 minutes. We continue walking down the main street until we arrive at the old cinema house and Lenin park. We view the main fountain and the bust of Lenin. Beside the train station is an old Soviet train from WII with the hammer and sickle on the front. Inside is a museum of the civil war between Moldova and Transnistria. When finished with the museum tour, we walk back past the park until we arrive at the city hall. The city hall has been left exactly as it was during the civil war still filled with bullet holes. Great for photos. We continue our walk to the river. There are statues and old amusement rides such as bumper cars here. It looks right out of the 1950′s, but the rides are still operated and are very cheap. After a stroll down the river, we walk back to the bus stop to catch our mini-bus back to Tiraspol. We check out of our hotel and go to the train station for the short ride to Chisinau. Check into centrally located Chisinau Cosmos Hostel. Central open air market, great place for kitsch souvenirs. Night of bar crawling in the city. Morning trip to Cricova Winery to see the wine making process and to of course sample some of Eastern Europe’s best wine! This is one of the most amazing wine cellars you are ever likely to see. 06.00 arrival in Bucharest (depending on customs). Check into hostel for a morning of rest and R&R. Lunch at local Italian restaurant. Free afternoon to independently walk around Bucharest. Evening dinner at Carru Cu Bere, easily YPT’s favourite restaurant on the planet. Evening drinks around Bucharest old town. No trip to Bucharest would be worth anything without paying homage to the don of extreme: Ceausescu! Early enough start for the Communist Tour. Learn about Ceausescu (surely one of the craziest of all the former dictators) and about life for Romanians who were living under his rule. Visit to the famous Ceausescu Palace, the ultimate example of the excess of the regime. We finish our Ceausescu based day by visiting his final resting place of the military cemetery where he is buried. This is a somewhat surreal, but worthwhile experience. Free evening to explore some more parts of Bucharest and buy souvenirs. 23.55 sleeper train to Sofia. 06.00 arrival in Sofia, check into hotel. Bulgaria food tour starting at 2pm! (tips based tour). At the end of the tour, we will take a quick walk up to the Soviet market where you can buy old coins, pins, watches, and even authentic Soviet and Nazi passports. We will head back down to the main square and warm ourselves at one of the heated outdoor bars! Night time walking tour of Sofia starting at 6pm. 07.00 bus to Skopje, North Macedonia. 16.00 Arrival and check into hostel. After getting settled, we will take a walk into town and have some lunch at Bella Vista restaurant on the waterfront. City tour of Skopje for some good old fashioned Soviet Stone architecture. See the many, many statues that make up the city and pay a visit to the Mother Theresa house. Walk to Old Town and check out the Grand Bazar. Quick walk up to the castle grounds then a final walk through the city (beautiful when lit up!). Drinks and dinner in the Old Bazaar. Morning bus to Pristina, the capital city of Kosovo. On the way to Pristina, we will stop at Matka and take a walk along the gorge. It is labeled as the most beautiful place in Macedonia and this credit is highly deserved! Following lunch at the restaurant at Matka, we will continue onto Pristina. Check into our very comfortable private apartments at Velania Hostel in Pristina. After settling up, we will go to the local pizza restaurant for delicious food and to warm ourselves up with their homemade rakija! Overnight in private apartment in Pristina. We get up early to board our private bus for the extremely scenic four hour drive to Brod. Brod is populated by the Gorani people. The Gorani have a total population of roughly 50,000 people. They are primarily sheep and cattle herders, but also have a cartel network of dessert/sweet shops. 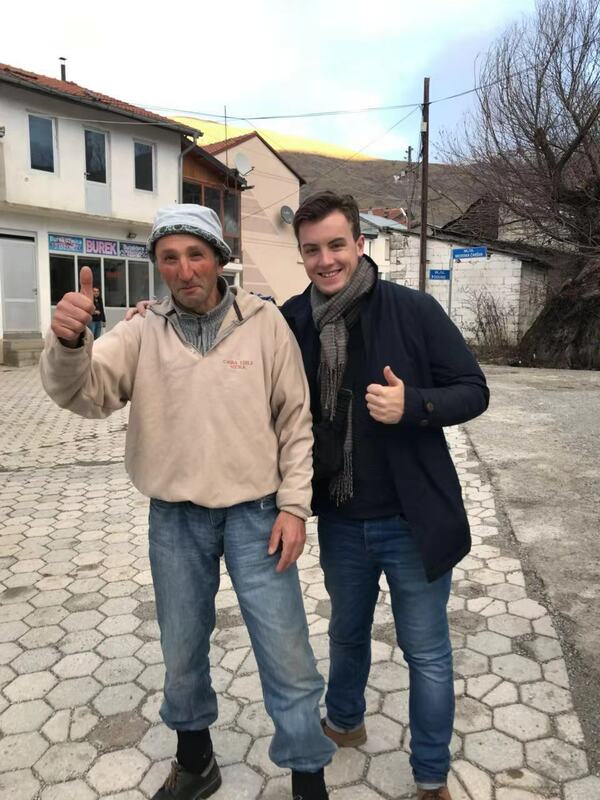 They live in a very geographically small mountainous area of the most southern part of Kosovo, in and near the city of Dragash just south of Prizren. The Gorani have their own language, which is a Torlakian Slavic language, related to Serbian and Macedonian, with Albanian and Turkish loanwords. We will stop for lunch at the new hotel that has been built just on the outskirts of Brod. We take our time walking around the old village, where there are numerous chances for some great photos and some wonderful hiking routes. A chance for dinner and drinks with Brod’s very famous “Borat,” a somewhat local celebrity that usually comes to meet our groups and is very happy to have a drink and have photos taken. Leisurely drive back to Pristina. Overnight at a private apartment. City tour of Pristina. 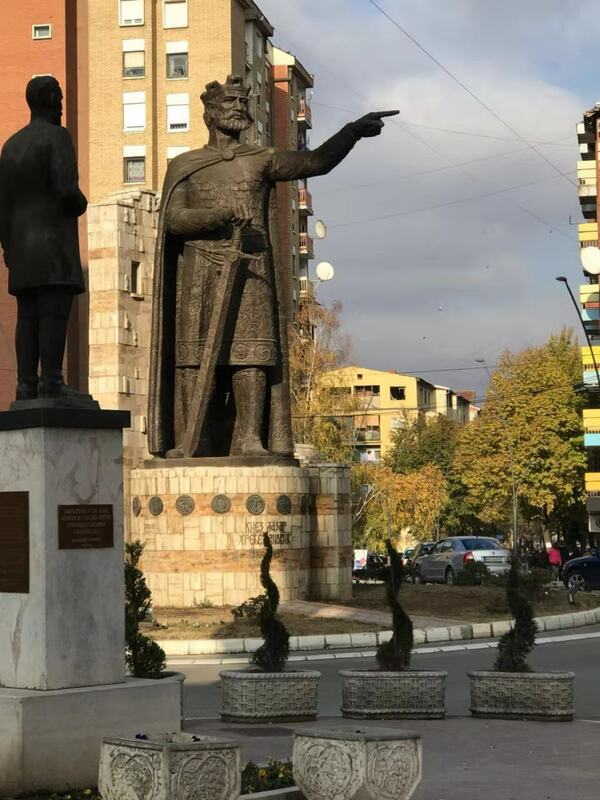 To see the city from street-level, it is best to start off in the Dardania neighborhood in front of the portrait of Bill Clinton and his statue, and stroll past the university to the Grand Hotel and UNMIK. Follow Nena Tereze street towards the Skenderbeg monument and the new Government Building, then point yourself toward the historic mosques and meander through the tight lanes of the Old Quarter. You will see cafes, street market stalls, kids hawking cigarettes and phone cards, plus the vibrant community life of Kosovo’s biggest city. 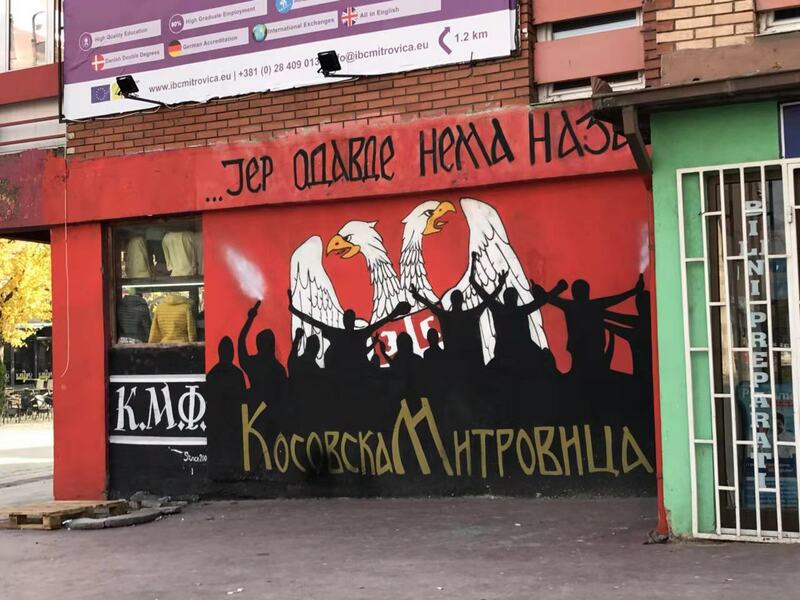 Short bus ride to Mitrovica, a town divided by a river into Kosovan south and Serbian north – scene of intense fighting in 1999 and troubles as late as 2013. Afternoon spent in the south surrounded by Albanian flags. 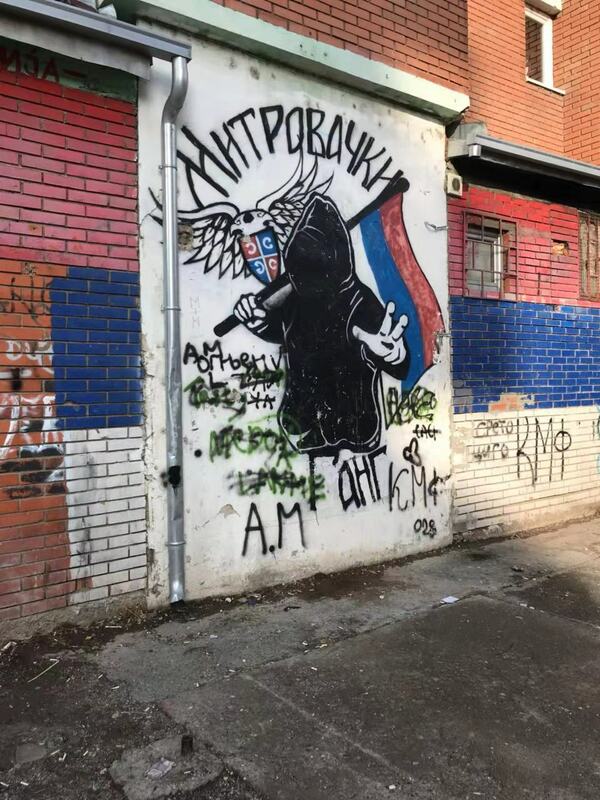 Transfer to northern side to check out the interesting Serbian graffiti and pick up some great postcards and t-shirts from a very interesting and slightly pro-Serbian gift shop. Return to Pristina to celebrate the biggest day of the year in the Albanian calendar, Independence Day. This truly is a trip highlight and one really not to miss. Pristina to Tirana by bus. Arrive in Tirana at about 6pm and check into Freddy’s Hostel, where we share 2, 3, or 4 to a room in an apartment style accommodation. Head to local restaurant for dinner and drinks. Last big night out in Tirana, where we check out the uber-cool Hemingway Bar and a local club that specializes in Albanian/Balkan style live pop acts. End of Group 5 with international flight options to most major European destinations, ferries to Italy, and major road links. 9am trip to both the newly opened bunker (an incredible throw-back to Hoxha’s reign) and following this, visit the grave of Hoxha (extra cost). Catch the direct mini-bus at 2.30pm from Tirana to our hostel in Montenegro. Arrive at our hostel at around 6pm. We will take the short walk to the local restaurant and try some incredible Montenegrin cuisine. Do a tour of the beautiful Montenegro coastlines! We will see Saint Stefan, Budva, Kotor and other little villages around the area. This really is one of the most beautiful parts of Europe but is still relatively untouched. Following some quick dinner, we will jump on our overnight train to Belgrade. As this train has no dining cart, we will stack up on drinks and snacks before we depart and can happily drink the night away on board. Check into Hedonist Hostel. It may be too early to check in but we can go for some traditional Serbian breakfast in the meantime! At 2pm, we will explore this incredibly fascinating city! We will do a city walking tour and take in such sites as the Republic Square, Bohemian Quarter, Kalemegdan Park, and the Belgrade Fortress (based on tips). In the evening, we will go back to the hostel to freshen up before once again going out to sample the delicious local cuisine. Tonight, we will go to Skadarlija – the pedestrian street through in which old Belgradian music constantly travels. As if the bars, restaurants, and music weren’t enough to keep us entertained on this street, it is also home to incredible artwork which adorn the blank-walled buildings on the south side. Stay out as late as you desire – Belgrade has many, many busy party spots on a Saturday night! Wake relatively early to catch the trolly bus out to the fascinating Mausoleum of Tito. There is also a great gift shop here where you can buy many hard to find Yugoslavian souvenirs. At 3pm, we will catch a bus to beautiful Sarajevo and arrive at Sarajevo City Hostel at about 8pm (private apartments). Rest and wash up before heading back out to town to warm ourselves up with traditional burek (meat pie) and local wine. Free morning to grab breakfast and generally explore. At 1pm, we will do our Sarajevo Siege Tour. The tour will include the main sites of the Ottoman and Austro-Hungarian architecture and show the unique line where east meets west. As we walk through the town, we will enjoy the scent and taste of both fresh coffee and hookah and we will hear the sound of the church bells mixed with the call from the Minarets. We will also see first-hand the devastating effects of the war that literally pitted family members against each other. As part of the tour, we will see the tunnel that allowed the people of Sarajevo to survive during the Siege and we will head to Mount Igman to explore the abandoned and crumbling bobsleigh track ruins from the 1984 Sarajevo Winter Olympic Games. We will return from Mount Igman and have dinner at one of the many pizza restaurants dotted around Sarajevo. We will return to the apartment to pre-game before heading out into the Sarajevo nightlife. Overnight at Sarajevo City Hostel. Catch the 10.46am train from Sarajevo to Zagreb. As this train is during the daytime, we will enjoy incredible Balkan scenery as we make our way from Bosnia to Croatia. Arrive in Zagreb at around 20:00 – a perfect time to check in, wash up and head out for some food. We will walk from the hostel, through the Christmas market and pick up some mulled wine and food from the fair. After dinner, we will hit the bars for a night of partying. Zagreb is famous for its drinking culture, so we will be spoiled for choice! We recommend that you try rakija (local schnapps) – cheap, delicious and authentic! Wake up and try some delicious Croatian breakfast! Head out in Zagreb to explore both Gornji Grad (Upper town) and Donji Grad (Lower Town). Christmas time is a beautiful time to explore Zagreb as there are many open air markets and fairs. Dinner at an open air restaurant in downtown Zagreb. At 6.40pm, we will depart on the three-hour train to Ljubljana, Slovenia. After checking into our hostel, we will head out to explore the local scene in Ljubljana. Farewell drinks for Group 6. City walking tour of Ljubljana at 11am. Free afternoon to explore the city at your own leisure. We board the 01.06 night train to Budapest! Typical YPT style sleeper carriage, with optional drinks on board. 10:26 arrival in Budapest and transfer to our centrally located hostel. Hit the ground running with a 3 hour communist tour of Budapest. This hits all important sites, such as where the 1956 Uprising occurred and is accompanied by an expert guide who will tell us about communist times. Night out eating and drinking around the old town and by the river. We jump on the bus at Budapest Station and begin the three hour journey to Bratislava, capital of Slovakia. Arrival and transfer to hostel, chance for some quick R&R before we head out for some lunch. Sticking to the tried and tested formula, we head for the Communism and Bunker tour seeing all the major red sites. Walk around the old town for dinner and drinks. We jump on the super quick four hour express EuroCity train from Bratislava to Prague. Afternoon arrival, today we take a rest from staying in hostels by renting our own private apartment, check into here, quick lunch and rest. After four weeks of almost non-stop communist watching, we decide to take a rest from all things red by indulging in our hedonistic side with a city bar crawl. We treat ourselves to a well deserved lie in after our night out in Prague. Walking tour of old Prague. We board the 23.08 train to Krakow, sleepers and drinks again as standard. We get up early to take the train to Krakow. 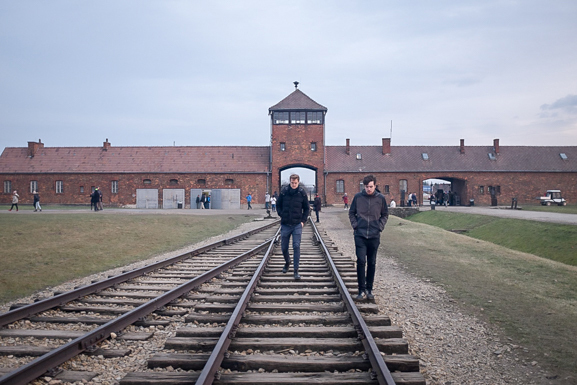 We take the train to Oswiecim and onward to the biggest mass extermination of the 20th century: Auschwitz Concentration Camp. We begin with a tour of Camp One, home of the iconic welcome sign, and the crematoria, before heading to Camp 2. This trip lasts the whole day and is a very physically and emotionally draining experience. On the train back to Krakow. We head out for final dinner and drinks in this extremely picturesque and Christmassy town. We’ll do classic walking tour of Old Warsaw taking in the old town which was the site of one of the most brutal uprisings in WW2, now completely rebuilt in old world style. After lunch we’ll be visiting one of Poland’s greatest WW2 museums. End of tour for those leaving group 7. Arrival in Kaliningrad around 17:00 and check into hotel and meet new travellers doing the Kaliningrad segment. Isolated from Russia and surrounded by Lithuania and Poland, Kaliningrad inherited a distinct Teutonic culinary tradition that has always been different from that of the rest of Russia. You’ll have the chance to try some delicious local Zeppelins: giant balls of mashed potato stuffed with various fillings and drenched in cheese sauce or Zurek: a soup with eggs, sausage slices and spices, served in a bowl made of bread. After a hearty breakfast at the hotel, we will meet our English speaking local guide and tour the city. Our first stop will be the Nazi command bunker museum, technically called the Blindage Museum, it tells the harrowing history of the last days of the Second World War. These are the last days of Königsberg and inside you can see how the city fell to Soviet Forces on the rampage of vengeance towards Berlin. Built by slave labour, the bunker’s gate that is made of thick steel wire and is covered in runic symbols. Supposedly meant to give supernatural defense to the German forces inside it. We will then visit fort 5, part of a series of Prussian forts that were a significant part of the unrelenting Soviet assault. Now museums and still littered with war damage, artillery pieces and Soviet monuments dedicated to WW2. After lunch, we will then have the rare chance to roam around significant piece of Cold War history. An excellently maintained Foxtrot-class Soviet nuclear submarine. See an original Nazi Kreigsmarine ship. Vityaz is a research vessel that was built in 1939 and served with the Kriegsmarine during World War II until she was seized by the British in 1945. We’ll check out the House of Soviets and see why the locals often refer to as the “buried robot”. See Victory Square with its hulking Soviet monument and The Brandenburg Gate which is one of seven surviving city gates from the former German city of Königsberg. After breakfast we journey to Mother Russia’s westernmost edge! Today we’ll be visiting the Heart of the Baltic fleet in the city Baltiysk. It is a huge Russian navy base located on the Baltic sea and has only been opened to foreigners since 1995, you have to get the special permission beforehand but YPT’s contacts in Kaliningrad can arrange this no problem. On the way, we’ll explore some destroyed and abandoned German era buildings and a typical soviet town called Svetliy. On arrival in the city we’ll be taking in sights such as the pentagonal Pillau Citadel, founded by the Swedes in 1626, completed by the Prussians in 1670, renovated in 1870 and currently holding an impressive naval museum. We’ll visit the ruins of the 13th-century Lochstadt Castle; a maze of 19th-century naval fortifications; the Naval Cathedral of St. George the 32-metre Expressionist observation tower the Gothic Revival building of the Baltic Fleet Museum, and an elegant Lighthouse, dating from 1813. A stone cross, erected in 1830 to commemorate the supposed spot of St. Adalbert of Prague’s martyrdom, was destroyed by the Soviets and restored a millennium after the event, in 1997. After breakfast, we’ll travel to the Curonian spit. It took several thousand years for the spit to shape out from the sands blown by the wind and dragged by the sea waves and to finally form a narrow sandy neck of land that separates the Curonian Gulf from the Baltic Sea and connects the Kaliningrad region with Lithuania. Its widest part is 3.8 km and the narrowest point is 400 m.
This place has no rivals in the world. Try to cross the spit from gulf to sea and you will notice how the landscape changes from a bare desert to a pine forest. The size of the Curonian spit is astonishing, it has no analogies in the world; its majestic scenery and the lavishness of the flora and fauna is simply amazing, varying from the taiga-like plants, mountain pines, and alder-trees to the tumbleweeds rolling in the deserts of the sand dunes rising up to 70 m high. After a day of exploring we will return to Kaliningrad city for our last dinner in the enclave with celebrations to wish farewell to those who will leave us tomorrow. After breakfast, those continuing on our Budget Baltics adventure we’ll leave for Vilnius by bus around 13:00 then arrive late in the evening and check into our hotel. For those arriving early with the Eurasian tour, we’ll enjoy breakfast then head out to explore the infamous KGB museum while we wait for the new group members to arrive. Meet up at 6 pm in the lobby, we will all get to know each other before heading out for some traditional Lithuanian food and go over the tour plan. Round off the night with some world-renowned Lithuanian beer in one of the many great bars of Vilnius. We grab breakfast and meet our driver outside for the journey deep into the woods of Lithuania to a former Soviet nuclear bunker. This is infamous, a no holds barred Soviet theme park that transports you back into the life of a Soviet citizen. On arrival, we will be stopped at a checkpoint manned by fierce, hulking KGB guards armed with Kalashnikovs and alsatians, marking the beginning of our Soviet Survival drama. We will then don Soviet army coats and dive into the USSR, full of tension and social peculiarities. You’ll be taken to the maze, watch Soviet propaganda and visit shops of 1984, be interrogated in a KGB office, learn the anthem of the USSR and get used to wearing a gas mask. You’ll dance to the music of the era and enjoy a Soviet dinner. Before leaving the bunker, you will be rewarded with a Soviet ID, an authentic gift from the Soviet times and a celebratory shot of Vodka! We return to Vilnius for a historical city tour. We check out of the hotel and leave our bags in reception. We grab some breakfast before meeting our driver outside who will transfer us out of the city to a military base. We will then don army uniforms and helmets before being introduced to our vehicle for the day, a hulking military tank, we will first ride on top for a few laps of an offroad track, then each person will have a turn at driving the beast! After the adrenaline fuelled activity, we relax at the base with a hearty Lithuanian BBQ. After lunch, the adrenaline continues as we transfer to a military firing range to shoot an array of high calibre weaponry, including Kalashnikovs and other Soviet weaponry as well as modern military firearms. We then transfer back to Vilnius to collect our bags and jump on the bus to Riga, Latvia! Nighttime arrival in Riga, we check into our accommodation and head out for some food. We get up early, grab breakfast and then some snacks for the road as we head to Latvia’s Chernobyl (without the radiation). A secret Soviet ghost town abandoned and frozen in time since 1988. This is a great site for those interested in urban exploration. After a two hour drive from Riga, your guide will show you the most interesting parts of the huge complex, and you will then have some free time to explore by yourself. Many of the Soviet relics are still on display, from military paintings and murals to hammers and sickles, it really gives the impression of being lost in time. We return to Riga and explore the city. We grab breakfast and check out of our accommodation before boarding the bus for the drive to Tallinn, Estonia. On arrival, we check into centrally located accommodation before doing a city tour of this ancient Baltic city. We grab breakfast and some snacks for the road before we begin our trip up to Narva on the Russian border! For a day discovering hammers and sickles, Lenin statues and T-34 tanks which will take us from beautiful medieval castles and coastal cliffs to ash-hills, half-empty industrial ghost towns and a Soviet themed museum. We will climb around the stunning ruins of Toolse fortress, Discover the Soviet industrial town & ash hills of Kohtla-Järve, enjoy amazing Stalinist architecture in Sillamäe, roam around the ghost town of Viivikonna, explore the Narva castle on the Russian border and see the 19th-century Kreenholm factory complex. During the day, we will grab lunch at a local Estonian tavern. Narva-Jõesuu czarist beach resort and the Kunda Hydro plant ruins. Dinner and drinks to celebrate the end of this incredible adventure through the whole of the Soviet world! *YPT terms and conditions apply to this trip. Where to begin? Visit every single former Warsaw Pact country, a number of former-USSR soviets, and even an unrecognized country in Transnistria!